Your notebook instance contains example notebooks provided by Amazon SageMaker. 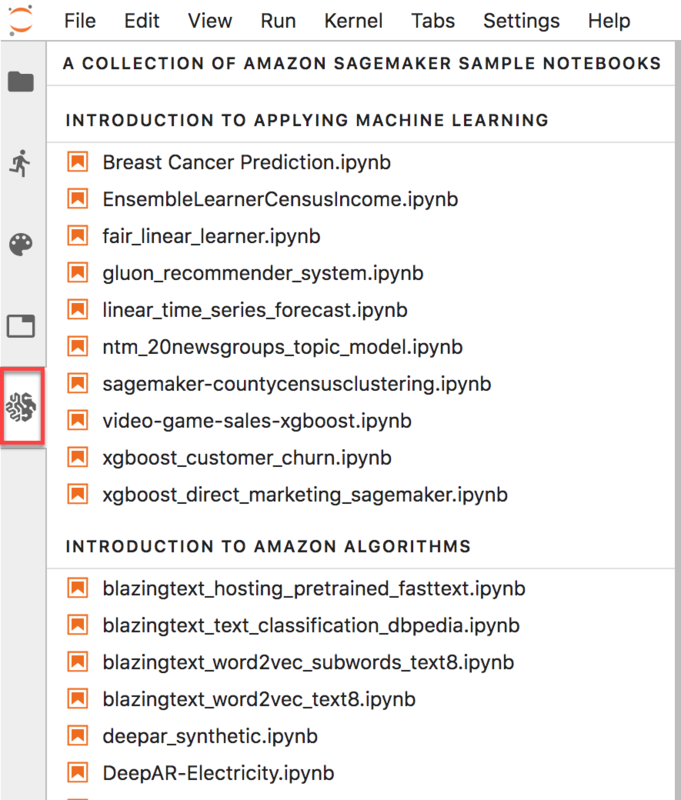 The example notebooks contain code that shows how to apply machine learning solutions by using Amazon SageMaker. Notebook instances use the nbexamples Jupyter extension, which enables you to view a read-only version of an example notebook or create a copy of it so that you can modify and run it. For more information about the nbexamples extension, see https://github.com/danielballan/nbexamples. Example notebooks typically download datasets from the internet. If you disable Amazon SageMaker-provided internet access when you create you notebook instance, example notebooks might not work. For more information, see Notebook Instances Are Internet-Enabled by Default. To view or use the example notebooks in the classic Jupyter view, choose the SageMaker Examples tab. To view a read-only version of an example notebook in the Jupyter classic view, on the SageMaker Examples tab, choose Preview for that notebook. To create a copy of an example notebook in the home directory of your notebook instance, choose Use. In the dialog box, you can change the notebook's name before saving it. To view or use the example notebooks in the Jupyterlab view, choose the examples icon in the left navigation panel. To view a read-only version of an example notebook, choose the name of the notebook. This opens the notebook as a tab in the main area. To create a copy of an example notebook in the home directory of your notebook instance, choose Create a Copy in the top banner. In the dialog box, type a name for the notebook and then choose CREATE COPY. For more information about the example notebooks, see the Amazon SageMaker examples GitHub repository.